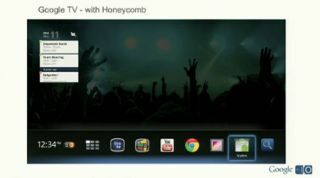 Google TV gets new Honeycomb interface | What Hi-Fi? More news from Google's I/O developer conference: having announced an update to its Honeycomb operating system, Android 3.1, it transpires Google TV will be getting it this summer too. Version 3.1 brings stretchable homescreen widgets and direct USB linking so you can download pictures from a camera or connect game controllers. And there should be a choice of apps available on your TV or set-top box from Android Market. Here's an early visual from our colleagues at Stuff.tv, showing a remote control navigable format. Although, presumably we'll all be using our Xoom tablet's to channel hop in future, no?